Apartment is located in the heart of the old town at Cankarjevo nabrezje, just a step away from Triple Bridge, central open market, castle hill and is an ideal base to explore the city. It offers a nice view over the Ljubljanica river. Two-room apartment for four people with a nice view of the river Ljubljanica is on the third floor of a traditional building from the 19th century, without elevator access. In the smaller bedroom, access from the main room, is a double bed (160 x 200 cm). In the main room there is another double bed, a comfortable sofa, dining table, LCD TV, ceiling fan, wireless internet access. 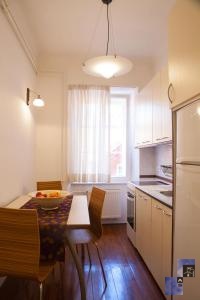 The kitchenette is equipped with electric stove, oven, refrigerator, dishes and cutlery. The private bathroom has a shower, toilet, sink and hair dryer. Self service buffet breakfast against additional payment 11 € at Vander hotel, Krojaska ulica 6. 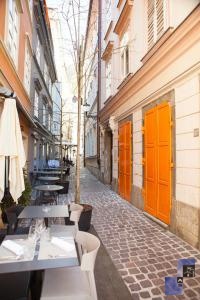 The Ljubljana tour with English and Russia speaking guide; 1-5 persons from 80 €.